Recently reviewing the start of this blog — that was begun about one year ago at the threshold of a brand new year — I was reminded of my intention to use the blog to share about the process of finding synthesis, the weaving together of creative efforts with lifelong themes and day-to-day experiences and thoughts. As the year ends, I’m so grateful for the blessings of this past year; and so hopeful and excited about the year ahead. The above photo shows a very quick study I did yesterday of a Cooper’s Hawk, to see the shape and structure and pattern of the wings for a collar I’m doing, as part of a “Hawk’s Dream” series. 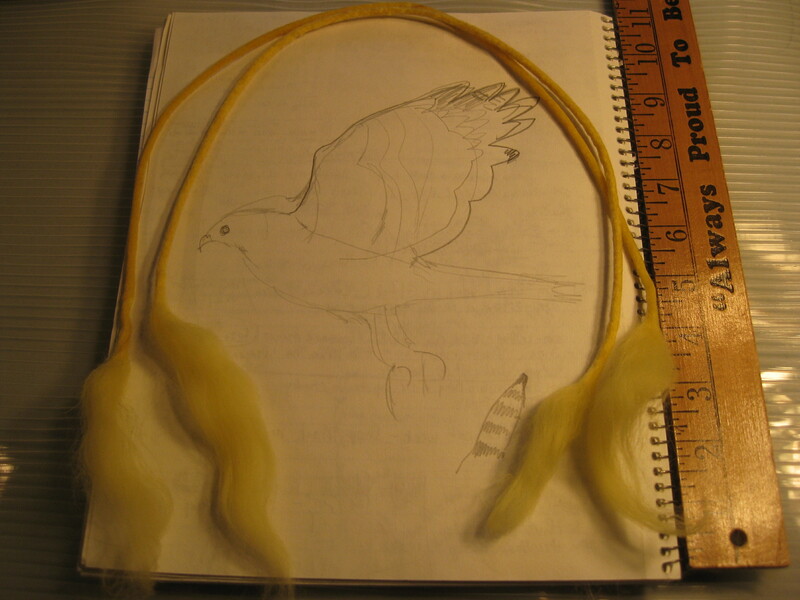 I fashioned the fluffy-ended yellow cords to use as ties in one collar (the fluffy ends allow me to embed the fibers into other fibers so the ties will become an integral part of the collar); and perhaps I’ll stitch and shape the thin cords into buttons or a pin closure for another collar. Cooper’s Hawks nest near our property, the juvenile hawks swirl and play in the huge trees that surround our home, and the daily sights and sounds of the hawks provide a sense of awe and a wild energy to my very home-centered days. This summer, working at my studio tables that face two very large picture windows that open to our back yard, I looked up to see a Cooper’s Hawk sitting on a cedar close to the house. The hawk was sitting about as close to the house as it could get. I was looking at the hawk, and the hawk was sitting watching me. As I work in the studio, I’ll often hear the crows and blue jays going wild outside, and look out to see a hawk right above our house. In traditional interpretations of animal totems, the hawk symbol suggests that one should not be distracted by details, but rather that one should seek some detachment and be observant; that by studying situations, one will know when it’s time for action. I find the hawk’s presence to be such a good companion and teacher. 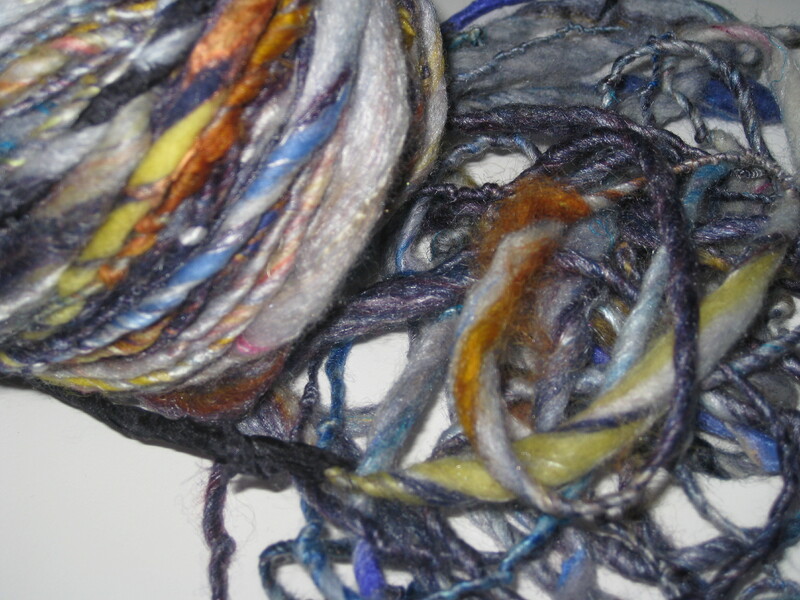 The above photo, on the left side, shows my hand-carder loaded with fiber. At the bottom of these layers of colorful fiber, unseen, is a layer of royal blue/purple merino fiber. 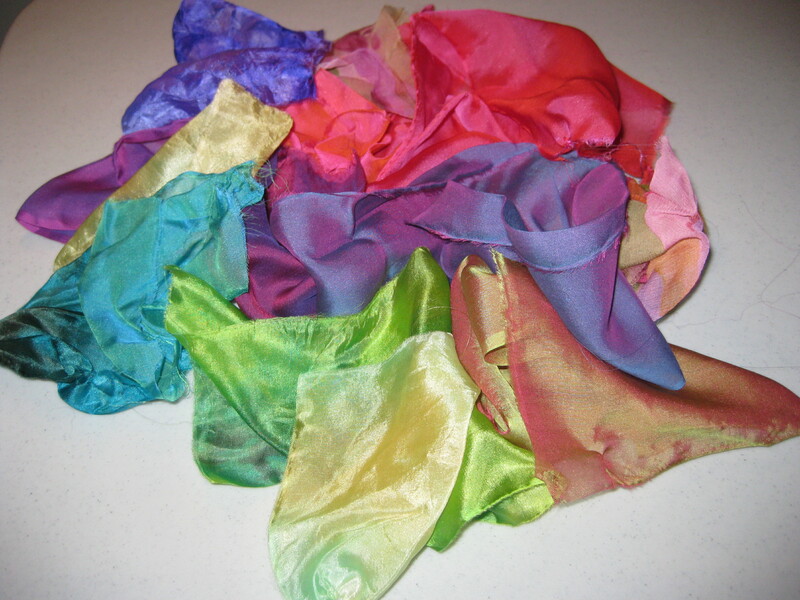 This is covered with a layer of the silks and other brightly-colored fibers that ARE visible in the photo. For the jewel-toned fiber “recipe” being spun for this project, this layer of mostly silk gets covered with a layer of mostly white merino, silk, kid mohair and cashmere. The three layers form a sort of “sandwich” of fiber: a nice thick layer of exquisite novelty fibers nestled between two layers of mostly merino. 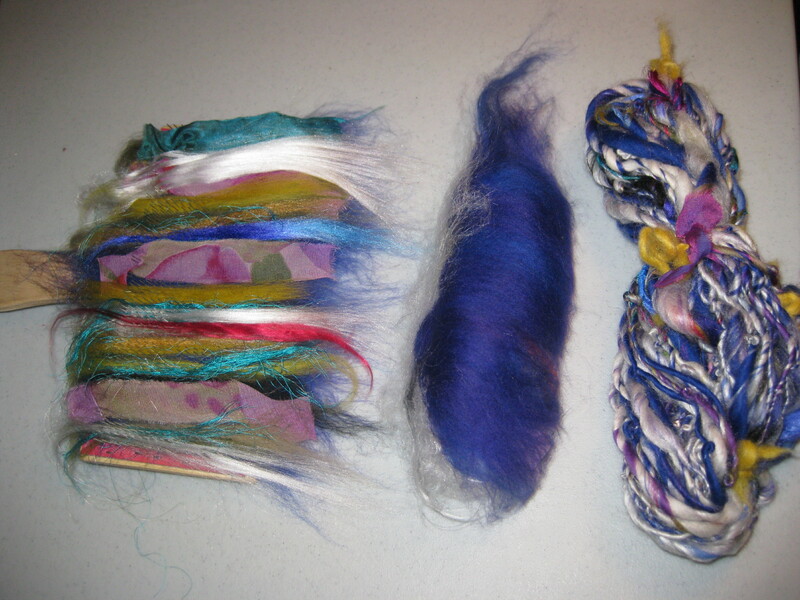 After these layers of fiber on the carders are somewhat blended by a gentle brushing with the two hand carders, and rolled up, the result is seen in the middle of the photo, the bright blue “batt” ready for spinning. On the right is a small skein of the yarn that’s been spun and is ready to be lightly felted — soaked in hot water with a bit of pure olive oil or lavender soap added for about a half hour; dipped in cold water with a bit of vinegar or lemon juice to remove all traces of soap; and then rinsed gently in hot water again. Then the skein is rolled dry in a towel and each skein is “thwacked” about 20 times against a hard surface to get the fibers to “bloom.” The bright yellow showing on the skein is mostly a lemon yellow yarn I use to tie the skein in five or six places to keep the twist and help it set when being lightly felted. I started carding and spinning yarn for a jewel-toned scarf. As I looked through my stash of fiber, it was as if every color and every sort of fiber wanted to join in. The challenge in this piece will be to feature several strong colors — bright pinks and rich purples, hints of red, with some greens — combining them in ways that highlight each color without having them compete with each other. I’ll “ground” these brights with some black and white, but not too much black and white because I don’t want to muddle or subdue the bright colors. Each time I layer the different fibers on my hand carders to create the fluffy batts from which I’ll spin the yarn, I’m creating a kind of abstract composition about a color: some batts are “about” purple; others are “about” the energy of hot pink shimmering next to deep green. 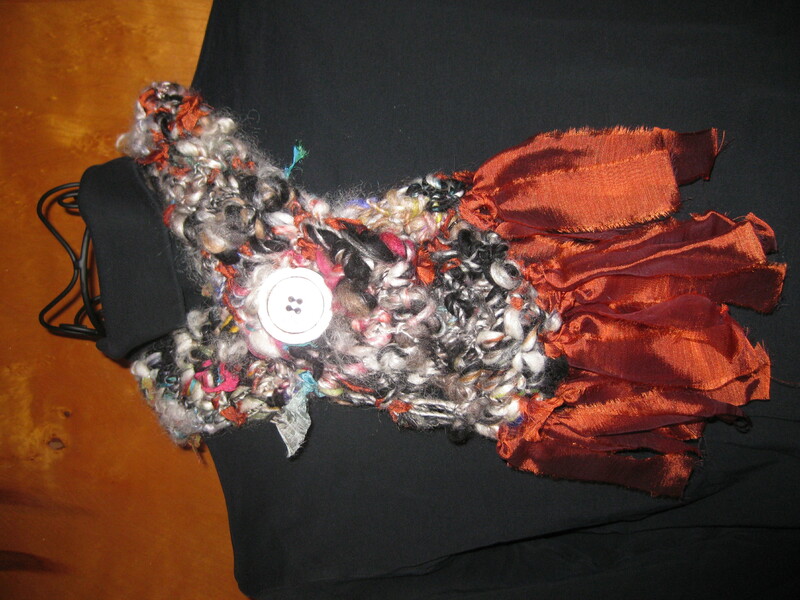 This abstract composition evolves as the fiber is spun; and then changes again in felted or crocheted form. This photo, above, shows the silk fabrics (not yet ironed or torn into strips) I selected to use in the yarn. Among the fabrics, hand-dyed silk from two artists and a sampling of silk chiffons from Mood, famous NYC garment district fabric warehouse. I’m grateful for the fibers and for the jewel-toned work on my table! There’s a nice balance in securing the wild, asymmetrical fibers of an art yarn piece with a simple button, in this case a big vintage mother-of-pearl one. In this detail you can really see how shimmery the silk fibers look and how the strips of silk fabric add textured “tags” here and there. I started this piece intending it to be primarily white, black and copper… and got carried away. 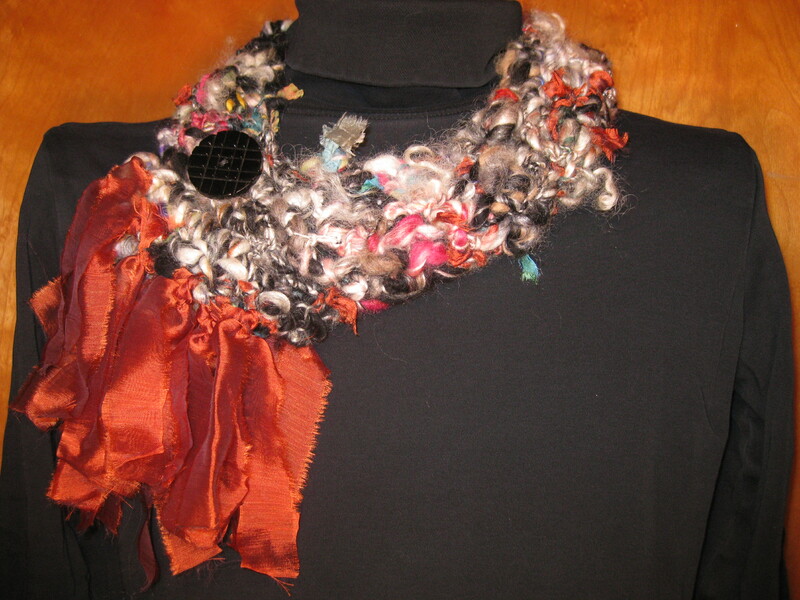 Two more views, above and below, showing different looks of the same scarf in different positions and with different sides of the 2-button closure. I used a bottom layer of a soft gray yak/merino blend; a mid-layer of mostly pure white silk; and a top layer of a baby camel/silk fiber blend. 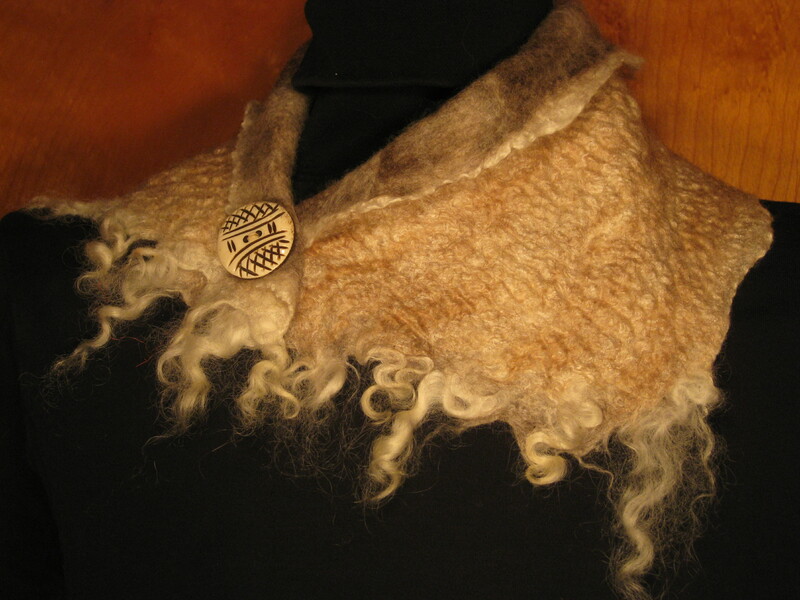 Tucked some curly white wool “locks” between the layers to form a soft fringe, and fabricated a pin from a handmade button, so the piece can be adjusted to size. 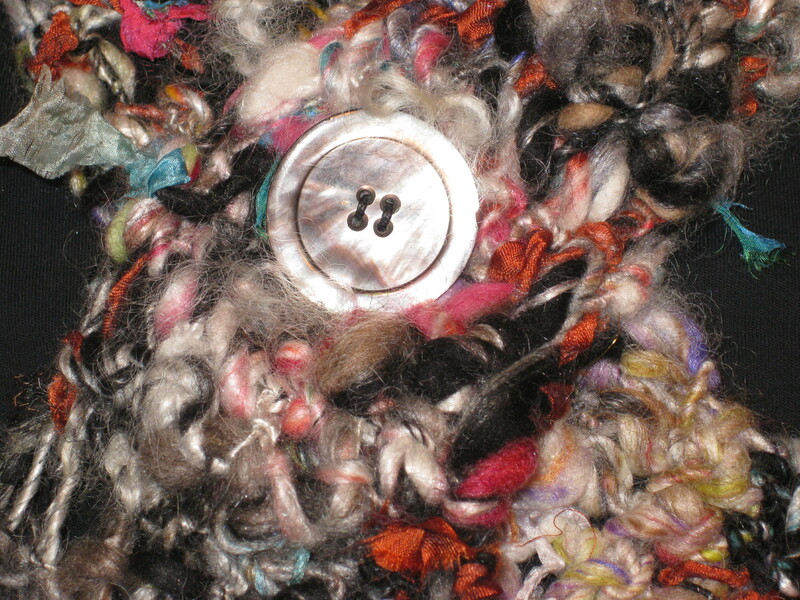 As I processed the piece the softly rippled texture formed on the surface, one of those wonderful feltmaking surprises. 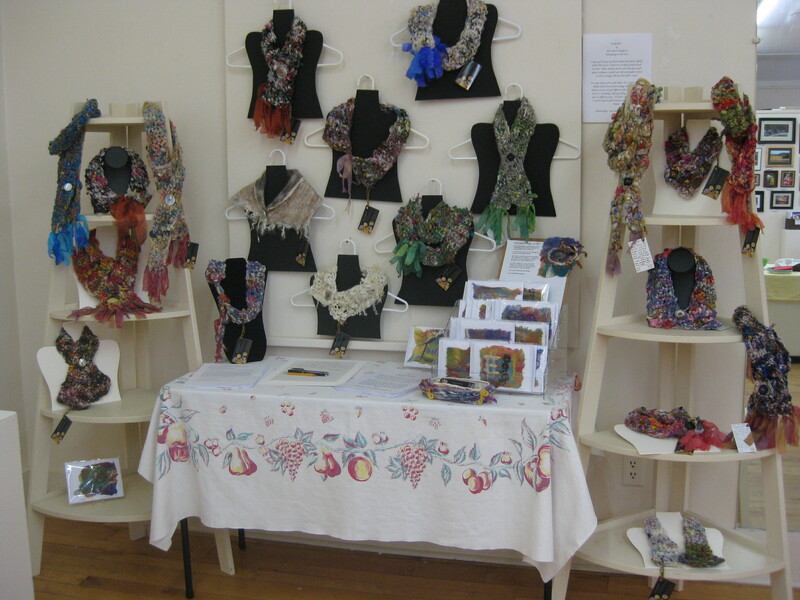 Here’s an image from my display at this past weekend’s Art Alliance Holiday Sale. I loved “sitting the show” and visiting with friends and other art lovers. It was so wonderful to share this new work and get encouraging feedback. I’ll be delivering some of the remaining pieces to The Gallery Shop in Lemont this weekend. With lots of shimmering silk, including bits of recycled sari silk, this yarn’s inspiration was the warm glow at night of the windows in our neighborhood, that look so golden in contrast to wintry nights. This past year I have been determined to figure out how to maintain momentum in my creative work while babysitting my grandchild during the afternoons. Wet feltmaking, which often leaves me up to my forearms in layers of fiber — or in the middle of very delicate detail work — was not the ideal art process for these cozy, cuddly afternoons of not knowing when or how long naptime might be. Being in my felting studio conflicted with wanting to be within reach of the baby. Similar conflict is experienced by every working artist/mom/grandma; and for me, this has been a re-experiencing of the effort to balance studio time and the rest of life that I struggled with as a mom. 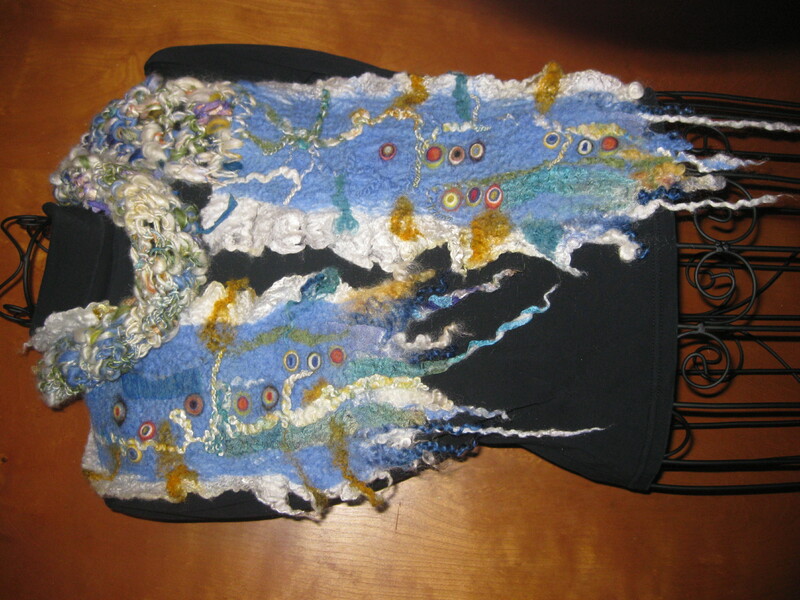 I explored new ways to work with the fibers in my studio. Last winter, the baby asleep within reach, I perused websites about art yarn and about hand-carding, hand-spinning and freeform crochet. After much trial and error, I developed a technique of crafting art yarn and lightly felting it while it’s in the skein stage; this light felting process coaxes the different fibers to “bloom” into their different textures while it also sets the twist and makes for a strong, funky yarn. 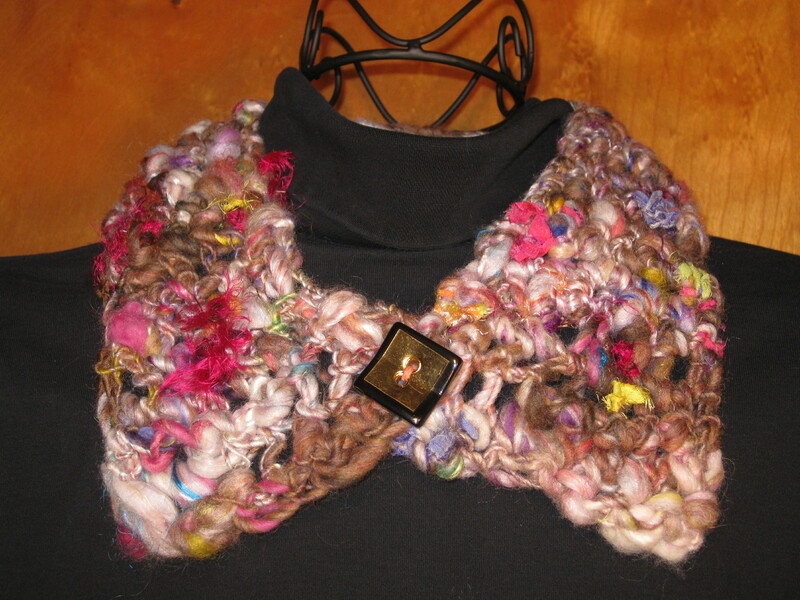 I’ve been using this art yarn to craft scarves and collars; to join segments of my wet felted yardage; and to embellish felted work. The process has been so creatively satisfying, purposeful, adaptable, blissful. In the coming weeks I’ll share images of this new work on this blog. And a reminder: art lessons and craft workshops make lasting gifts, support local artists, and do not contribute to the landfills…!